At the beginning of this week, my two oldest daughters and I attended a 3-day parent practicum held by Classical Conversations. It included an overview of the Classical Conversations program (which we already love), tutor training for me and academic and play camps for the girls. Because it was a bit more than an hour away, we decided that it would be easier for the three of us to stay in a local hotel, and we had so much fun! 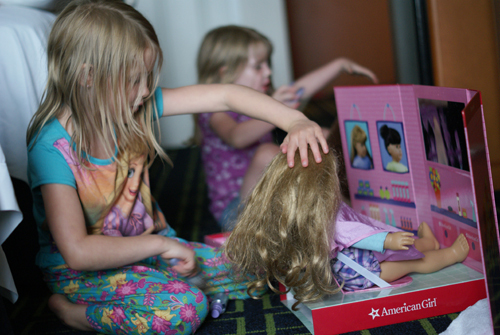 I had gotten this adorable American Girl hair set for them on clearance a few weeks ago, and it was a lot of fun to surprise them with that. Thankfully, it also kept them busy in the mornings and evenings as I worked. They also got their own key cards, we got breakfast at the hotel each morning and, of course, there were elevator buttons to push and a pool for swimming. It was a fun little getaway for the three of us, and I will definitely cherish those memories!